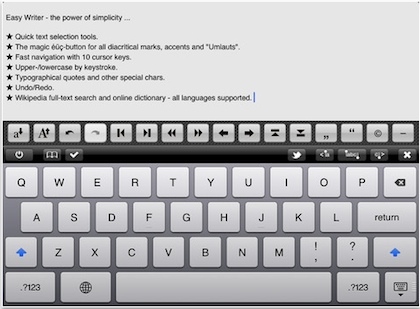 We have covered many quick writing apps over the last year. They all have their claim to fame. Some only let you see the area your working on, some have many layers of saving options, others have automated conversion to HTML, etc… Developers are trying to find what is really needed on the iPad to get the text on the page without a bunch of extra fluff getting in the way. One that we covered before, 1a Easy Writer, has a couple things going for it. The app lets you work with documents in your Dropbox and iCloud accounts very easily – which means it is easy to collaborate and share with others. Also, it has an extended keyboard (yes, it splits for thumb typing if you need) so you can get to those handy navigation tools without having to go through a pull down. And, it works well with the developer’s other apps. The last appears to be in part why 1a Easy Writer is ‘free’ for now… they would very much like you to buy a copy of their other app Word-2-Text. The Word to Text conversion app is for taking a Word (doc,dock) Document and stripping out all of the extra bits so you have the core text to work with. Work with, like in their 1a Easy Writer app. So, we like 1a Easy Writer and Free might be a great reason for you to take the plunge in and grab a copy. If you deal with a lot of Word docs that you just want the text of then edit and share, explore their other Word-2-Text app.